I don’t think that Big Hero 6 got enough credit. I’ve seen it a couple times now, and each time I appreciate it more for what it is, and I forgive it a little more for what it isn’t. The story is spectacular and engaging. The characters are varied and entertaining. The animation is impressive. And Baymax is a once-in-a-lifetime creation, a scene-stealing entity that comes to life in a purely magical way. The movie works from many different angles, and it also catches lighting in a bottle, flying mostly under the radar but with an inherent quality that’s there if you know where to look. Next Gen tries to capture the same mini-genius, but only proves that it’s not that easy. Instead, it comes off as a cheap copy with few new ideas, a second-rate animated action flick without much extra to offer. In the future, robots are the new pets, the news maids, the new cars, the new friends, and humans can’t live without them. A massive robotics corporation produces bots for your every need, and the new Generation will be the best one yet. Mai’s mom is totally obsessed, standing in line to be one of the first for the new model, ready to take it home and watch all her dreams come home. But Mai isn’t interested, she’s tired of bots taking over, and so she goes exploring during the big corporate reveal party. What she finds is something she was never supposed to see. A new project has just been brought online, a new machine with martial capabilities and AI technology that make it something extremely special and expensive. It follows Mai home, and they begin a strange friendship, but it was built for a very specific, very dangerous purpose, and she’s about to be caught in the middle. 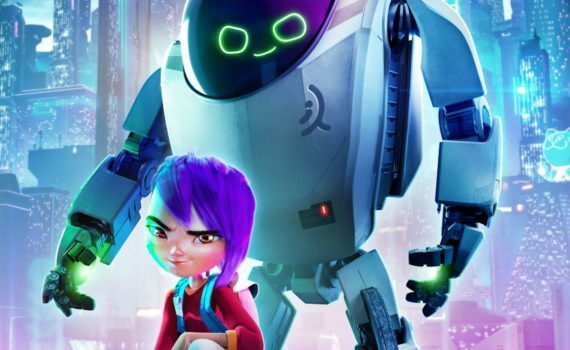 Next Gen is way too much like Big Hero 6 to be ignored, from the big bot and its friendship with the kid to the evil business tycoon and his futuristic cityscape. I guess the former waited a while and the latter wasn’t a huge hit anyway, but to me they’re still too similar, because I liked the content better the first time I saw it. But there are some differences, and some positives, so it’s not all a carbon copy. The action is packed in from the very beginning, and it’s a little more comic book firefight than animated scuffle, so make sure your kids are ready for it, but it’s pretty impressive. So are the jabs at our iPhone culture and our dependence on technology, so look for the nods and for the critiques. But despite a nice start and a pretty awesome ending, the middle of the movie left a lot to be desired. That’s when the action dragged, that’s when the relationship between the girl and the bot was the highlight, and it’s the slowest part, really slogging for a solid 45 minutes. You can’t have a great film if half of it is dull, even if some other moments are impressive, and you can’t simply cast name actors as voice overs and call it a day. More was needed to make Next Gen great; as it is it’s only fine.